This week, have you noticed that many people in Knowlton looked as if they were suffering from low-blood sugar levels; many of us shuffled about bleary eyed and dragged our feet as if a deep dark and raining psychological Cumulonimbus cloud were dumping misery and strife upon us as if we were all a tragic bunch of Linus’s straight out of Peanuts! Of course November is never easy and the first sight of snow is enough to turn even the heartiest Townshipper into something that, from a distance, shivers like a quivering mound of cranberry sauce with a toque and mittens! Oh my…not again! First comes the cold and then the snow and then the abomination we have come to call “winter” hits with full force. But the low temperatures and minor teasing of snow flakes this week couldn’t be the reason for the look on the faces of Knowlton residents…it took me a while to figure it out but as I left the office last night at 5 o’clock I came to a sudden realization as to why I’ve been so grouchy this week: Daylight Saving Time and the clocks falling back took effect! It suddenly made sense as to why it seemed that a sudden mood disorder had swept through my brethren in Lac Brome! It was pitch black at 5pm for goodness sakes! No wonder no-one had any energy to spare any more! We finish work at 5 o’clock, if we’re not on shift work, and it already feels like we should be in bed. By the time we get home, cook supper and do the most basic chores like feeding the cat and taking out the trash it feels like it’s midnight; dark, cold and in-hospitable and we are feeling like subterranean moles who haven’t seen the sun for ages! Let's take a look at how we're doing as far as having useable daylight here in the Eastern Townships...let's look at the difference between May and November. First look at the healthy looking May Sunshine chart with a balance of sunlight before and after work. No wonder we’re all out of whack! To make things worse, by the time we do get to sleep, it seems like it is only a matter of minutes before the sun comes up as if on an accelerated schedule…but at 6am! Why in the name of all that is Holy do we need to have the sun shining at 6 in the morning? Having the sun set before most of us are even finished work should be considered cruel and unusual punishment! This is akin to environmental waterboarding for Pete’s sakes! How, without the aid of a wheelbarrow full of Celexa or Wellbutrin, can a citizen expect to survive this deprivation of life giving sunlight? Why even bother going back and forth? What kind of twisted mind even came up with such a notion of altering the clocks in such a way? Apparently around 1905, some “prominent” English land developer and outdoorsman William Willett was somehow inspired to invent Daylight Savings Time during one of his pre-breakfast horseback rides when he observed with dismay how many people slept through the best part of a summer day. An avid golfer, he also disliked cutting short his round of golf at dusk. His solution was to advance the clock during the summer months, a proposal he published in 1907. Excusez-moi une momento! 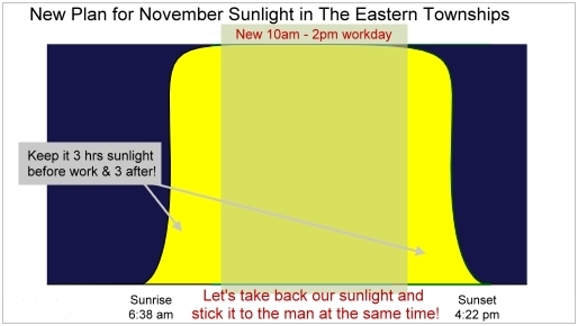 This entire Daylight Savings Time concept was created by some leisure-suited Larry who enjoyed prancing about on a horse at 6am and then would spend his evening contributing to society by swing golf clubs? My goodness…someone pass me a few ounces of Dramamine please I can’t bear this notion! 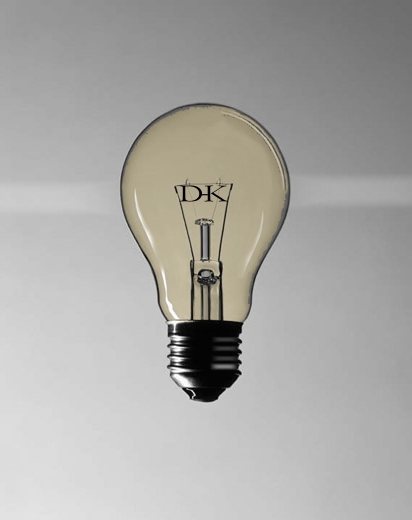 DST has come and gone and undergone many transformations around the world and it seems that it is costing more money and creating more problems than it actually solves. Finding out that Seven-11 lobbies hard for Daylight Savings time so they can sell more Slurpees or that the Sporting Goods Association also spent buckets of cash convincing politicians in the US that daylight saving time was a good idea…yeah sure…good for their business…but what about the human cost?! There are many countries that don’t wreak havoc with peoples lives and leave the clocks alone…there are countries that have tried it and have stopped…when will we take a stand and tell the leaders in charge of such critical societal regulations that we need to make changes in the way modern time is handled or we will be come a country of eyeless mole people who hibernate from November to March. 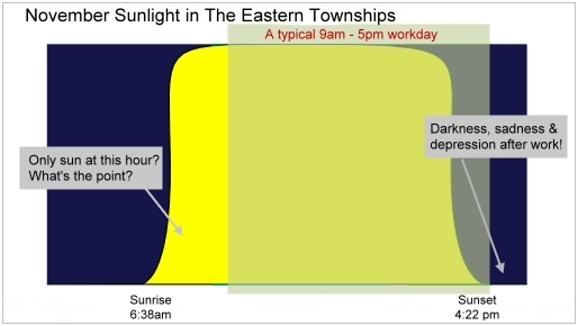 In fact judging by the population of Knowlton it looks like a lot of people go south where the sun shines after 5pm. The lights are off and the sidewalks are empty! But not all of us can afford a seasonal frolic on the beach; some poor sods need to work all year and this lack of sunlight must make them simply miserable! There have been proposals set forward to have a Single/Double Saving Time which would put the clocks one hour ahead in winter and two hours in the summer…if this means more light after I’ve finished work I’m all for it! And since we’re in Canada we should call it a “Double Double” and add even more daylight hours but just letting everyone off work two hours earlier between November and April…now that is a platform to win an election on! Remember when NASA was driving their remote controlled Mars explorer all over the red planet? Apparently, the scientists involved in the project had to be awake during the Mars day and then sleep during the Mars night so they could communicate with their little surface rover and they were forced to ignore the day and night cycle of planet Earth. If they went into NASA command at 9am Earth time it was 4 in the morning on Mars and the rover was asleep in the shadows! The brainiacs at NASA designed special clocks that adjusted to the Martian planets’ rotation and all the scientists on the project had special wrist watches and bedside clock-radios that followed Mars time and adjusted to the variations of Mars different daylight schedule. The scientists quickly adjusted to this alternate time zone so maybe we should take a lesson from these rocket scientists! Why not treat time like an ebbing and flowing tide? 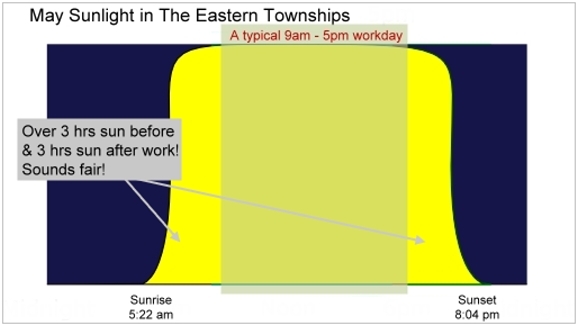 Why not have the “hours” of the day expand and contract according to the length of the day? I know, this is sounding a bit existential, but bear with me…I’m suffering from light deprivation and retinal withdrawal! The average working stiff can still serve his eight hours per day for the man but those eight hours shouldn’t be uniform like a piece of string , they should be like an elastic band, stretching and contracting to maintain a fluid motion…this is nature’s way…just ask David Suzuki! And don’t give me the old argument that this would wreak havoc with the economy…have you looked at the world’s economy lately? This is hardly an example of a working model of efficiency…the planet is literally dying from over-exploitation so maybe by giving back the sunlight to nurture our souls we will make things better instead of sacrificing our precious lifespan toiling away with blue fingers in the dark! Enough of this Daylight Slaving Time! One astute resident of Knowlton commented to me that the turning back of the clocks had such an effect on the spirits of residents that it was the very reason they didn’t sell rope at Canadian Tire in November; if they did, most folks would be swinging from the rafters at the end of a noose! Of course he was joking…or was he? As he spoke he looked chillingly similar to Horatio Cane just before the opening blast of We Won’t Get Fooled Again!